Never charge a SHIDO lithium battery with more than 15V. Over 15V is lethal to a lithium cell so when in doubt check the tension provided from your alternator does not climb above 15V in different RPM from your engine. Always use a specific lithium charger, they have an adapted algorithm for lithium batteries which is different from lead/acid chargers. Do not allow to drain your battery under 9,6V, the lithium battery will be difficult or impossible to recover. Electric consumers such as alarm systems installed on your bike drain your battery. We recommend to use a lithium charger with maintenance mode when you store your motorcycle for more than one week. This period depends on the capacity of the consumers. Although the start capacity of a lithium battery is higher, the reserve capacity is only 1/3 of a lead/acid battery. When you do not use the bike and there are (hidden) electrical consumers the battery will drain 3 times faster compared to a lead/acid battery. It is recommended to charge the battery with the standard number of Ah as shown in the Battery Data. If you want to charge really quickly it can with the maximum charging current so you Lithium battery is charged in maximum 20 minutes. The SHIDO Lithium battery is equipped with a LED indicator that checks the voltage of your battery. When pressing the “test” button it will show you the status of the battery. With three illuminated LEDS or ‘Full’ everything is OK, with two lit LEDs or “Med” is preferably to charge and one lit LED or ‘Low’ you have to recharge the battery. A SHIDO battery is completely maintenance free and has no venting like some lead-acid batteries. Cells and electronics are waterproof sealed in the container so that the battery can also be used for Jet Ski. The battery cannot leak and thus may be used in any position, even upside down. 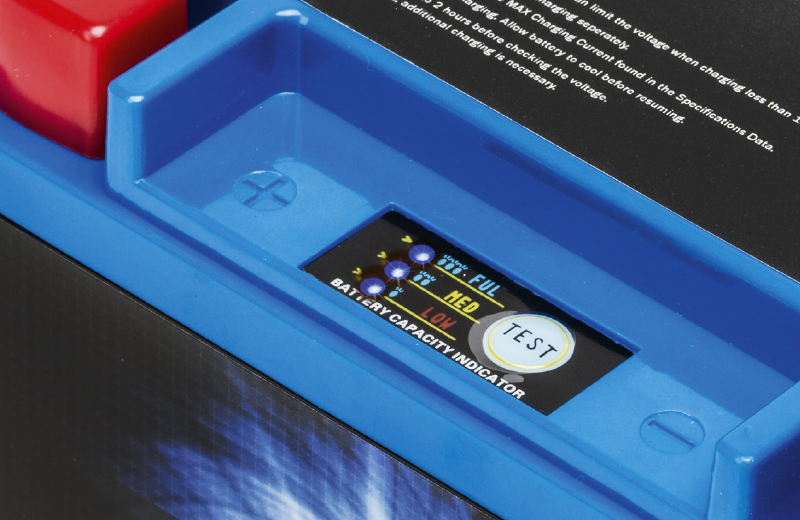 For most lead-acid batteries, there is a SHIDO Lithium alternative. Since its shape is identical to a lead-acid battery, it can be easily installed and connected in your vehicle. The universal terminal allows all connections. Some SHIDO batteries are equipped with four terminals, two positive and two negative poles, simply by turning the battery 180 degrees this Q(Quadri) terminal battery has whether the positive pole left or right. When properly connect the LiFePO4 is the safest Lithium cell available, improper use will warm the battery, but will not explode or burn. Disposal of lithium batteries must be done according to the regulations of the country or region where you live.